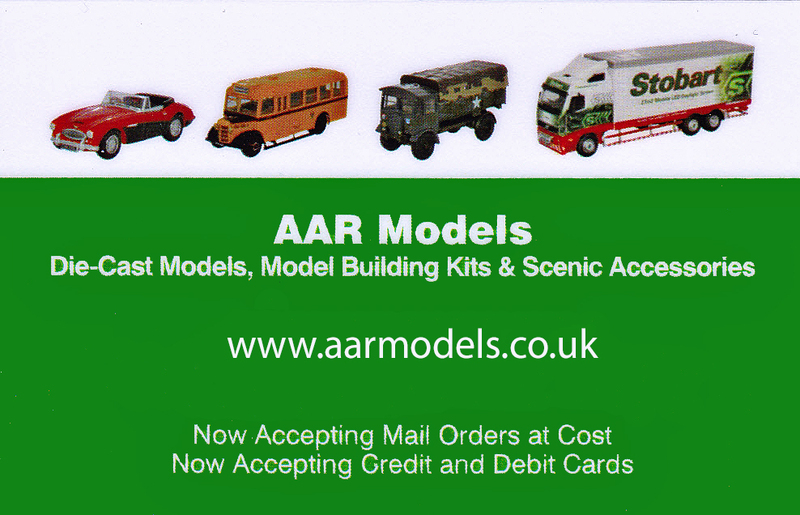 AAR Models is based in Southampton and run by Andy Lamb, assisted by his wife Ann and son Ryan. They are very well known on the model railway scene in central southern England and appear at many of the larger shows. Besides selling diecast vehicles, kits and other model railway items from: Base Toys, Cararama, Corgi, Dapol, EFE, Oxford Diecast, Oxford Rail and others, they also exhibit model railway layouts and organise their own model railway exhibition at Minstead in the New Forest (Hampshire). In addition, Andy and Ryan are also members of the Southampton and District Transport Heritage Trust and can often be seen manning the preserved buses at various events. An on-line shop is on its way, but until then you may place orders for either collection at a local show or for delivery by mail by clicking here. It is with regret that, due to deteriorating health, we are having to wind down our attendance at shows this year in favour of trading on-line via this website. We have also decided to cancel this year's Minstead show - but we hope to have it back it in 2020. However, you will not be seeing the last of us.. Whilst Anne has retired to become a lady of leisure, Andy and Ryan will spend more time with their rmodel railway layouts which will continue to be available for exhibitions. Over the next few weeks and months we shall be updating our website to reflect our new existence. Finally, we would like to thank all of our customers and helpers of the past 22 years for their support. Andy and Ryan look forward to seeing you at the remaining shows that they will be attending this year and at future exhibitions where they will be running their layouts.